A week ago, the world lost Oscar Taveras, a bright young talented star to a tragic car accident. His girlfriend also perished in the accident. Since then, The Kansas City Royals were defeated by the San Francisco Giants in the World Series. Baseball has come to a standstill again and closed its doors for the year. Clubhouses are desolate and general managers are stretching out their hands for the inevitable phone call charade. The St. Louis Cardinals have to be in shock still over the loss of Oscar, which makes me think their offseason plans are still running second fold to a real blunt tragedy. As fellow Cards blogger Kevin Reynolds pointed out today in a roundtable session( I won’t tease any more so you can read it on I70 Baseball tomorrow), the loss of Taveras is especially rigorous when you think about how high of a pedestal the Cards placed him on three years ago. A gaping hole has taken place in the Cards minor league system. A “what now” situation has developed. Let’s run down the list of potential outfielders for the St. Louis Cardinals in 2015. Jon Jay, Matt Holliday, Peter Bourjos, Randal Grichuk, Stephen Piscotty, Tommy Pham and not Shane Robinson. That’s six guys for four spots. Who stays and who goes? Who can produce at a high level and who is a fourth outfield type with a deceptive ability that has to be masked in spot starts? Before Oscar’s death, he was going to compete for the right field spot which plunged Jay, Bourjos and Pham into center field and left Grichuk staking his claim for playing time in right with Taveras. I like Randal but STILL don’t see him as a regular everyday bat out there. Pham is intriguing but has gotten 2 at bats to show his stuff. His body could hold up and he could be here in 2015 but that’s not a guarantee. Piscotty has the very good arm, decent bat and Matt Carpenter like longevity to garner a look in 2015 but that’s uncertain as well. If there were cards on the table and a wager placed today, the bet would be Grichuk starting opening day in right field. That doesn’t make me very happy. Sorry. Now you can think short term and worry about 2015 or you can think long term and take a big bite. 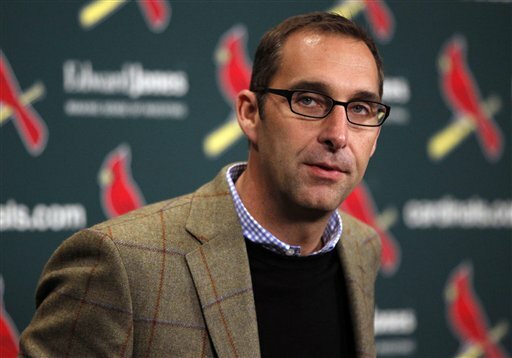 John Mozeliak had his hands full before the tragedy and they only got more complex last Monday. A short term fix would be Michael Cuddyer coming into the fold. He is 35 years old, a free agent and has some pop and average hitting ability left in his lumber. He could also play first base if needed. Ben Zobrist is there for the taking if the Cards can deal. They are both multi-position threats. Neither will make crowds chew their fingernails in anticipation but each carry a unique flavor when their name is popped. That is short term. A player who can help, not dominate, a position. Marlon Byrd also comes to mind as a resourceful yet short term fix. A long term answer is a player like Giancarlo Stanton, the most dreamy and equally unrealistic landing of any fan’s mind. You could insert him into right field and center field wouldn’t matter. It would become the Giancarlo show and his home runs would lift the Arch. Nelson Cruz isn’t a long term fix but he would supply the power this team needs and was lacking in 2014. He can swing it, and it’s even better when he does it clean. If the Cards decide to do nothing and retain Jay and Bourjos, their starting lineup could look like this. Carpenter, Jay/Bourjos, Holliday, Adams, Peralta, Molina, Wong, Grichuk, pitcher. The #2 hole and #8 hole can switch easily but that’s your lineup. It could be streaky like 2014 0r certain players could come into their own. Sure, Mo could go after injury prone yet game changing shortstop Troy Tulowitzki. When healthy, there isn’t a better all around shortstop in baseball. Peralta would move to third base, and Carpenter could shift to right field or first base if Adams was dealt. That’s extreme and actually more likely than Stanton. That would provide the Cards with a true core player for years to come, even if it was most likely 130 games a season. There are other options out there. Would the Atlanta Braves relinquish Jason Heyward in a deal? Probably not. The Cards have enormous pitching depth. Their infield depth is questionable at best. Their outfield depth lost a huge chunk of real estate with Taveras passing away. That event shifted Piscotty and Pham into potential big roles and could push Grichuk into a full time spot, to start at least. The options are endless for the Cards. Their rotation is crowded with eight potential candidates. Their infield is set, barring a huge trade. Their bullpen has some set pieces but a few relatively small moving parts. If Pat Neshek departs as a free agent, Carlos Martinez most likely stays down there and takes over the 8th inning. The biggest question and area of intrigue is the outfield. Matt Holliday is your leftfielder. Right now, that is the only completely certain thing. Sure, Mike Matheny and Mo said Jay was their starting center fielder but the recent events could change that. Two spots remain open today. As Reynolds pointed out today, there are some older bodies in this Cardinal lineup. Holliday has a couple years left. Yadier Molina has a few years left but could be showing some decline at the plate. There isn’t a legit power bat in the lineup unless you count the days when Peralta and Adams are hot. The Cards lineup could use a dose of power right now. Will they get it? Who knows? What would I do? I would go small right now, sign Cuddyer and see how the young guns fare with more playing time. Piscotty, Pham and Grichuk. Let them run with it. I am not sure I would bring back both Jay and Bourjos but they could. For me, you see what the kids can do before a big splash is made. Give it until the deadline or the entire 2015 season. It’s November and the trade talks and rumors have begun. Look for the phrases “sources say” and “according to” to be heavy players from here until February. The on field action is finished. The off field board game has begun. Strap in for an interesting winter, folks.